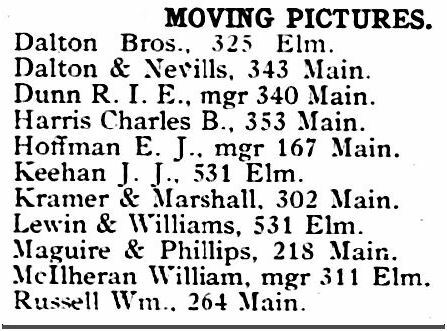 Below is a clipping from the Dallas city directory issued in 1907 — the first year a special “Moving Pictures” category was included in the directory. These “picture shows” were listed not by theater name (if they had one), but by owner or manager. (This was the era of nickelodeons, which were not so much “theaters” as “viewing rooms” — a great article from 1909 about the sudden surge in popularity of the nickelodeon — what they were and what they were like — can be read here.) 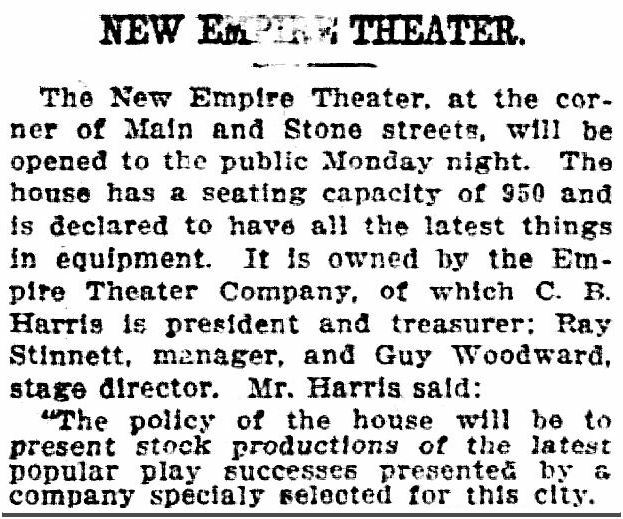 The theater at 353 Main was owned by Charles B. Harris (usually referred to as C. B. Harris, who had previously worked as a wholesaler for the Edison Phonograph Co. a couple of doors down the block). 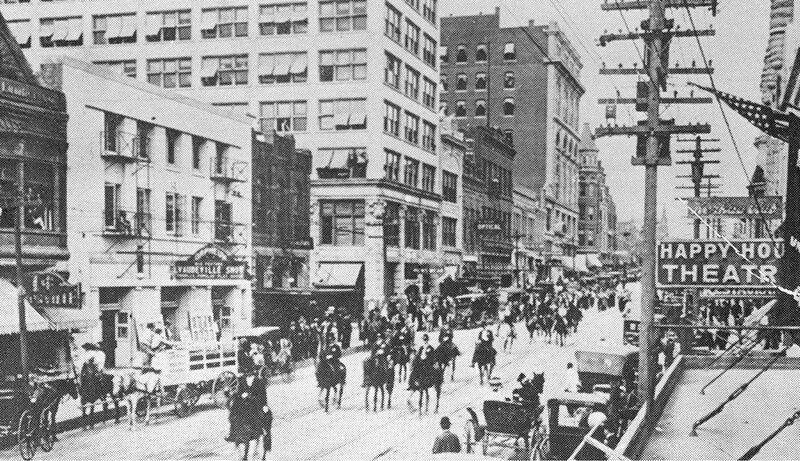 When the picture above was taken, the Empire was showing movies at 353 Main, men were playing pool for 45¢ an hour at the New Brunswick Billiard Hall next door at 355 Main, and Bartholomew Lynch was running the Imperial Bar on the corner, at 357 Main. 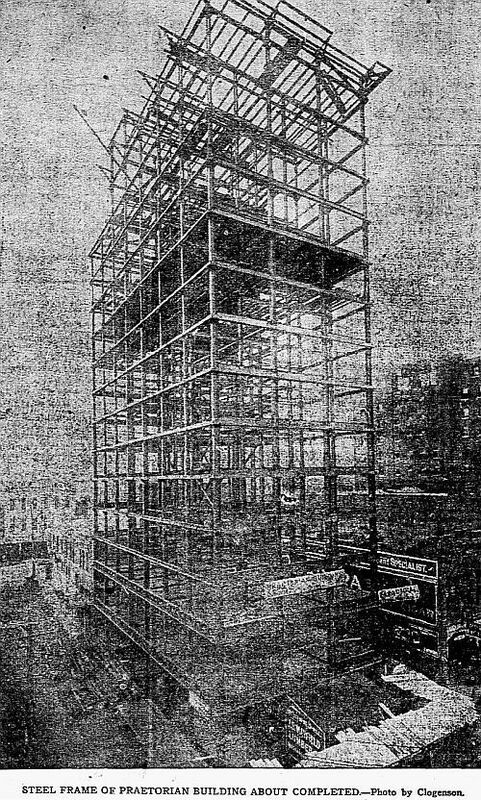 In January, 1909, C. B. Harris decided to expand up and into the space next door. 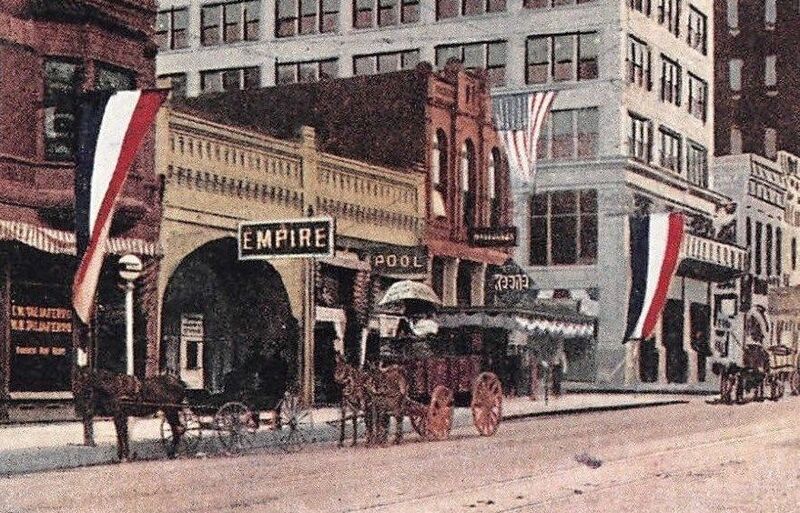 The Empire Theater stopped showing movies, and in March, 1909, it became a venue for live stage productions. 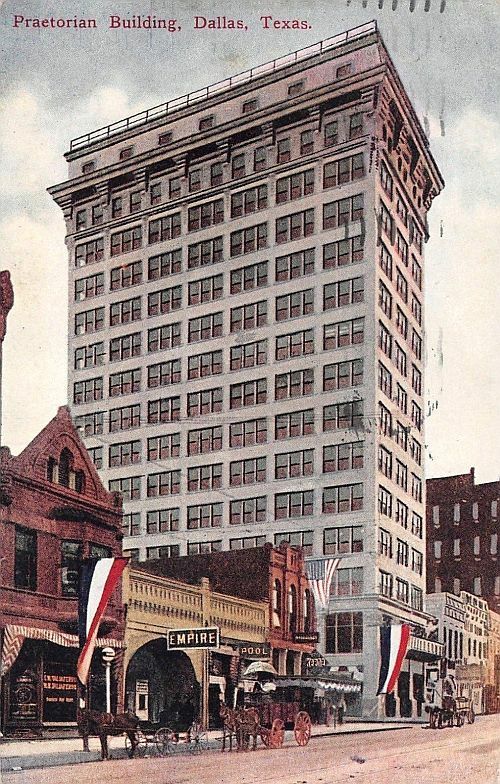 Here are a few photos showing the Empire and the finished Praetorian Building, around 1909. The first one may be one of the few to show the short-lived Colonial Theater (352 Main), a vaudeville house, across the street. Here is another postcard view, showing the Empire (the detail of this image is at the top of this post). 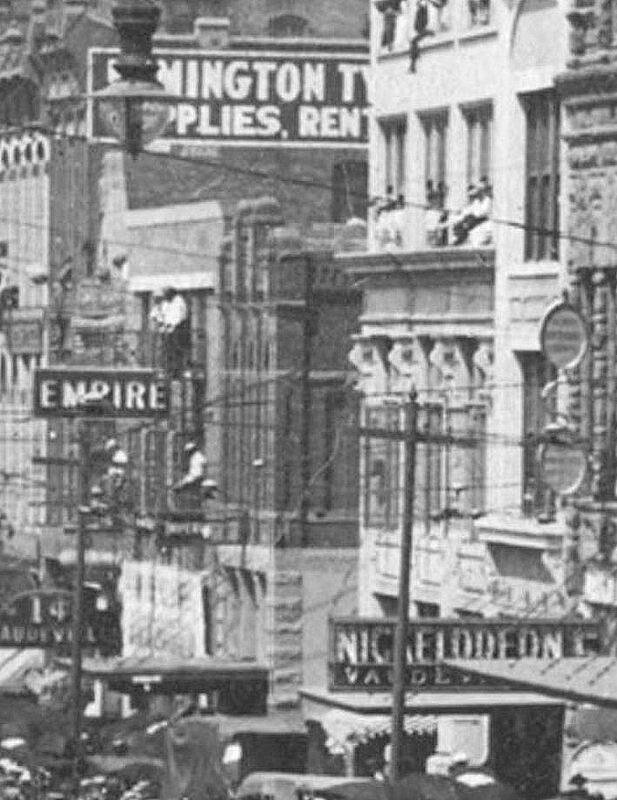 Below, a detail of a larger photo, also from around 1909. 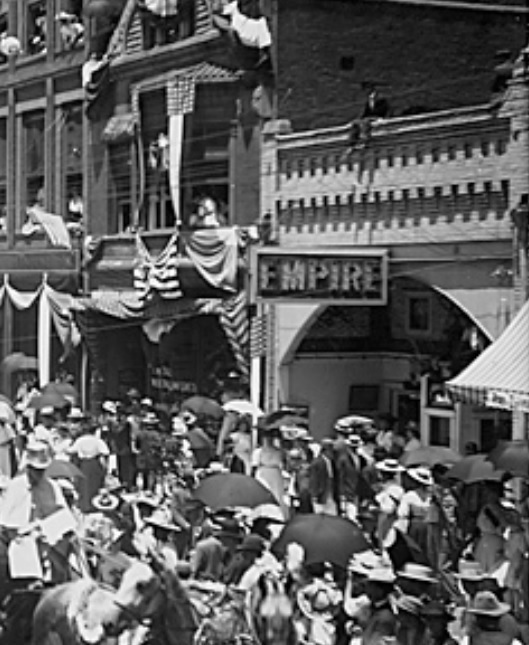 And below, a detail from a larger photo, with spectators watching a parade in August, 1909, showing the Empire with its new construction. 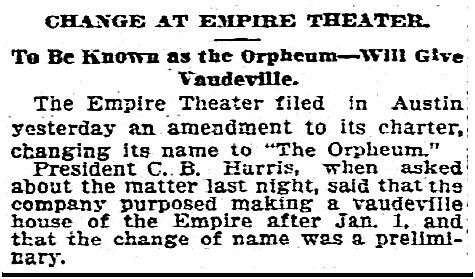 In December, 1909, Harris changed the name of the theater to the Orpheum — it became a vaudeville house. 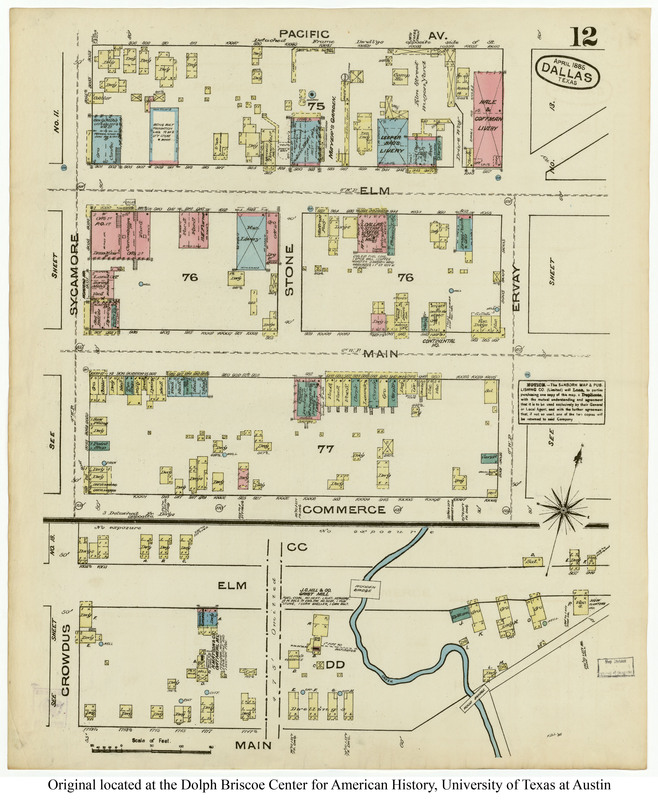 By 1914, the building’s address was 1521 Main (or, more specifically, 1521-23 Main), and ownership of the theater (which was now featuring “tabloid musical comedy”) had changed hands (to the Dalton brothers, who owned the Old Mill Theater). 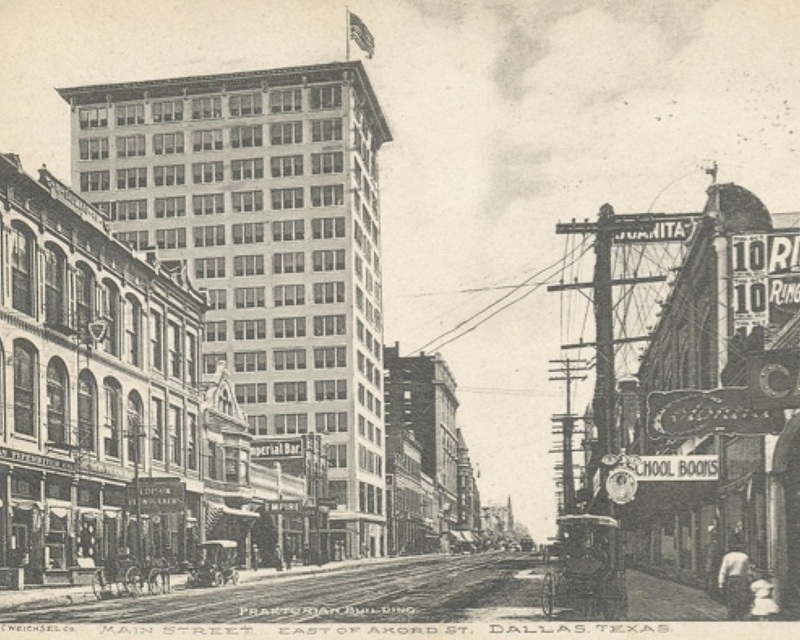 In October, 1914, the Daltons sold the theater. It was extensively remodeled and became the Feature Theater, a motion picture house (once again!). 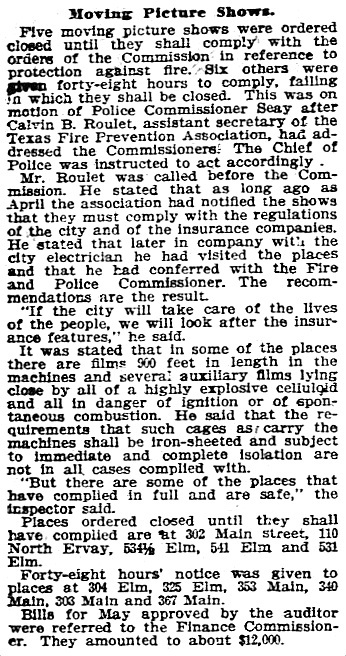 The Feature hung on through the Great War, but finally sputtered out in 1919. 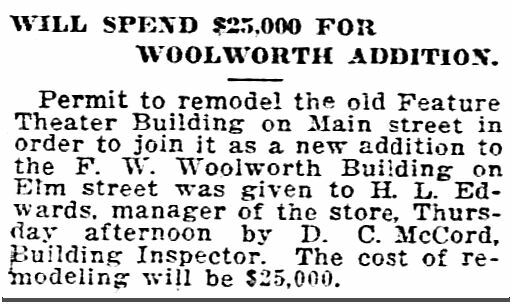 In 1920, Woolworth’s expanded into the space (they were already located on Elm Street, and the expansion afforded them entrances on both Elm and Main — and, I think, Stone. 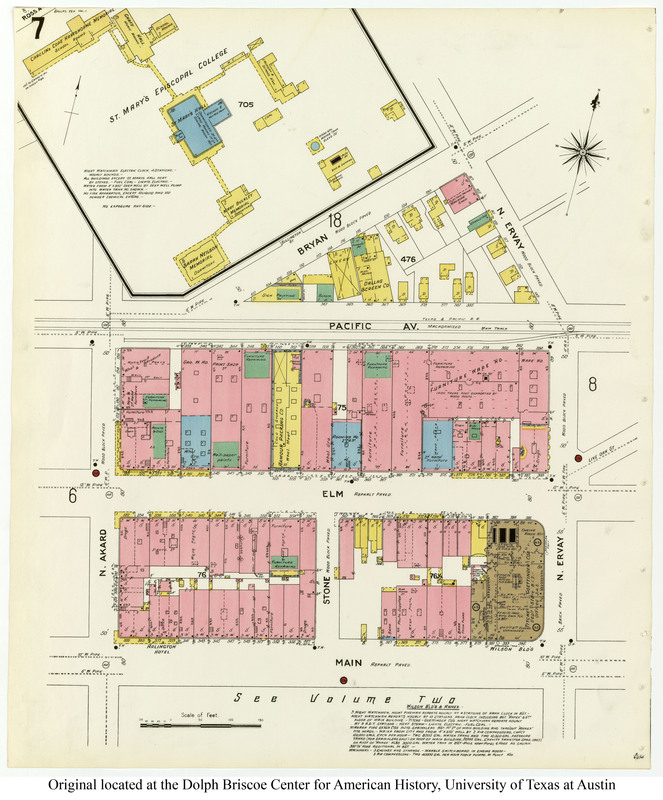 Woolworth’s had already been occupying the old Imperial Bar building on the corner when they took over the old Empire space (1525 Main). That was a big Woolworth’s store. Here’s what our old pal, The Praetorian, and NKOTB, Woolworth’s, looked like around 1930. Here’s Woolworth’s closer up — you can see how the two buildings (the old Empire and the old Imperial Bar) have been joined together a little oddly. Here’s a grainy street-level view from the 1940s (sorry, tried to blow up a thumbnail). 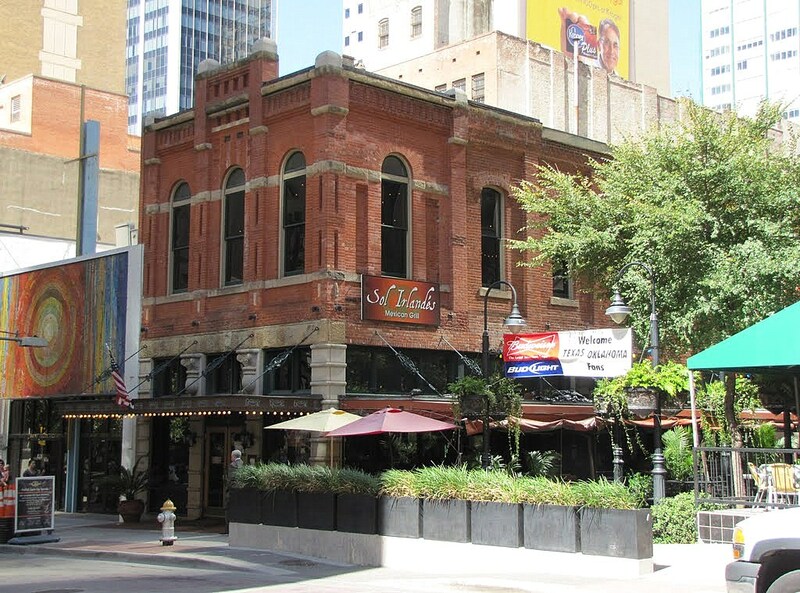 Fast-forward to 1953: the Shaw Jewelry Company moved into the old Empire Theater space at 1521 Main. 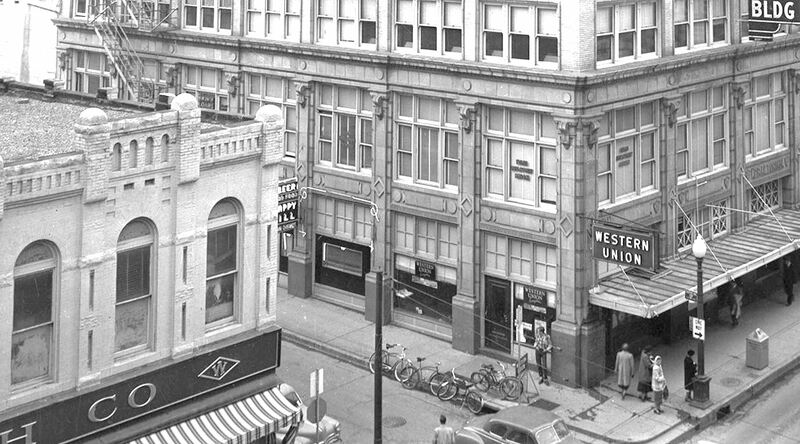 And here’s the same corner after “improvements” (this is another detail from another of Squire Haskins’ fab photos from the UTA collection — see the full photo here — click on thumbnail), circa 1950s. Oh dear. There should be a law…. 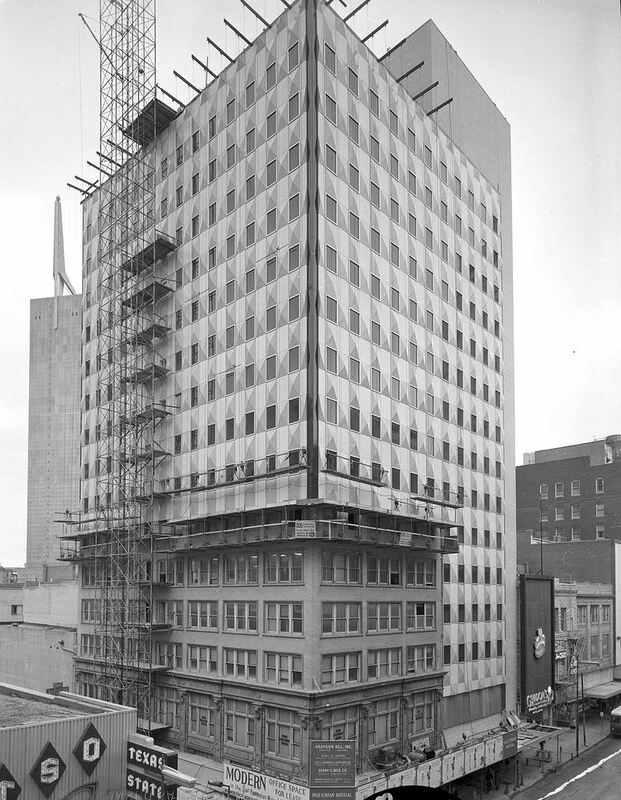 Speaking of “oh dear,” a few short years after this, the Praetorian Building expanded and was … argh … “re-clad.” Here’s a shot of it, mid-cladding, about 1961 (Squire Haskins photo info from UTA here). I believe it was … yellow. 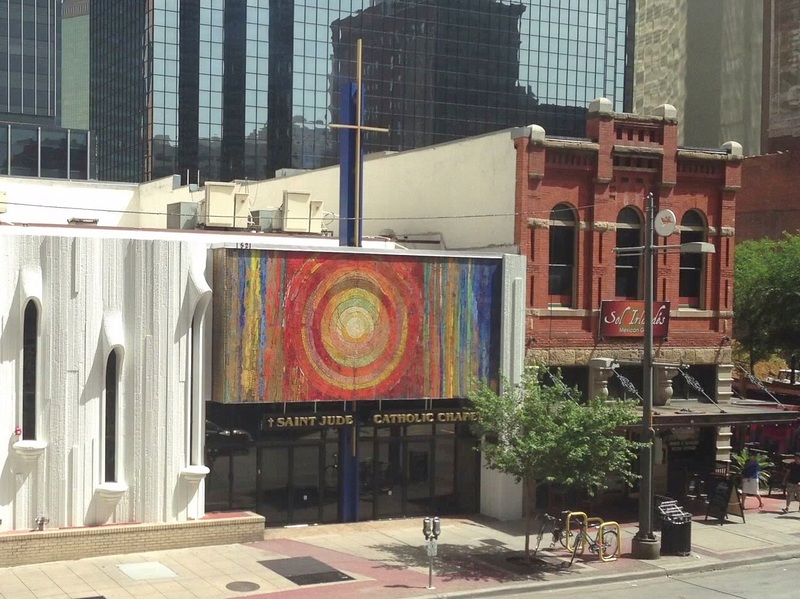 In 1968, the Saint Jude Catholic Chapel moved into 1521 Main — the old Empire Theater space. 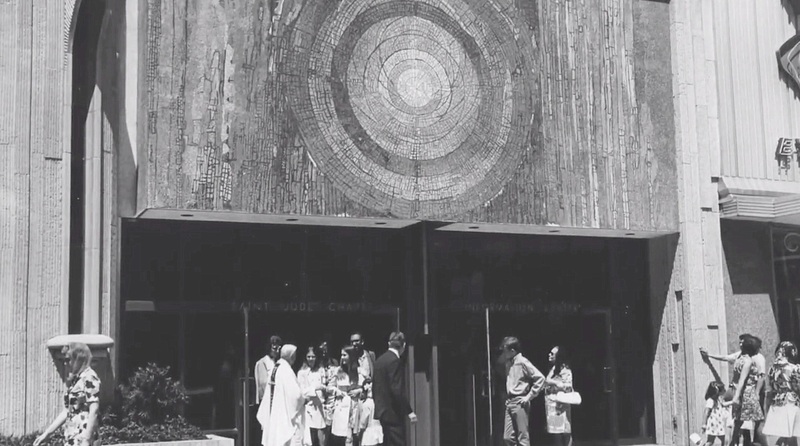 The front was adorned with a vivid mosaic by Gyorgy Kepes (I wrote about the mosaic here). The chapel is still there. So. Back to the top photo. There’s good news and bad news. 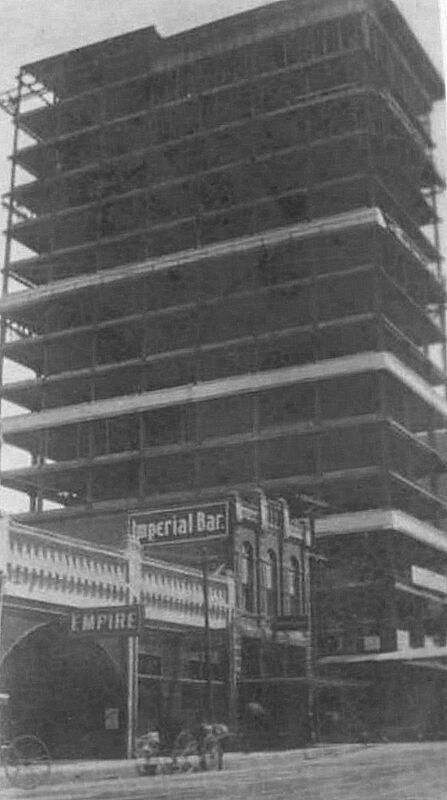 Empire Theater building: still there. 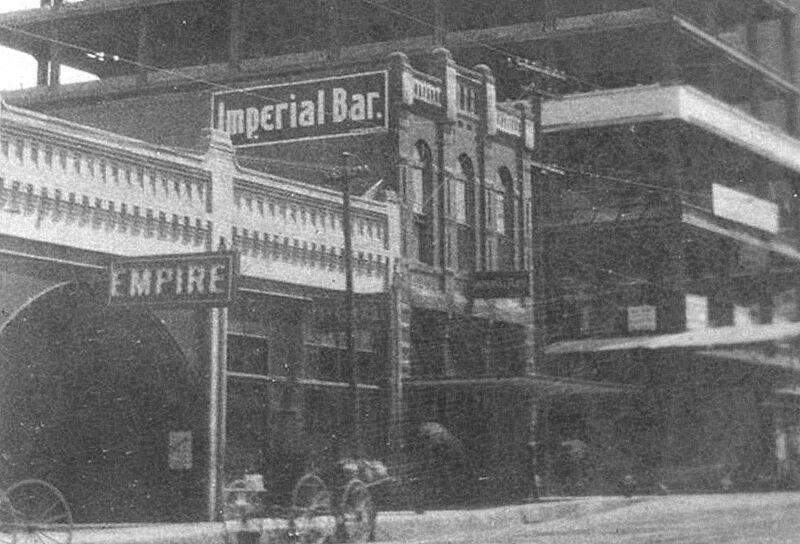 Imperial Bar building: still there. 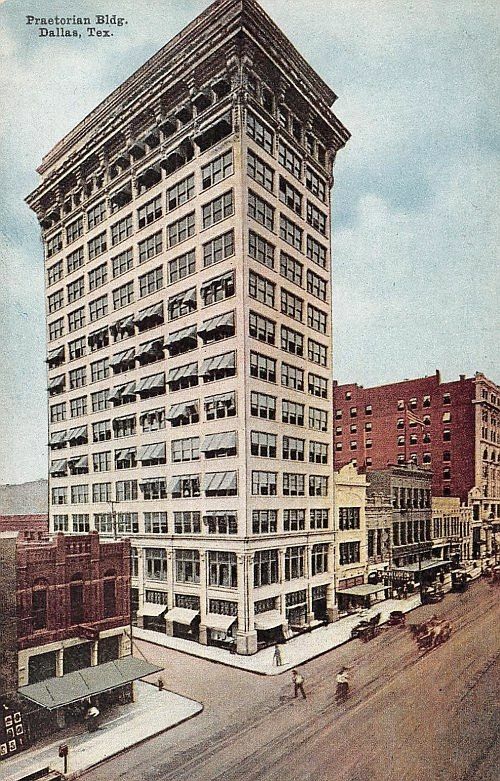 But the Praetorian Building — the most historically important of the three? The fabulous “skyscraper” was demolished in 2013 and replaced by a giant eyeball. 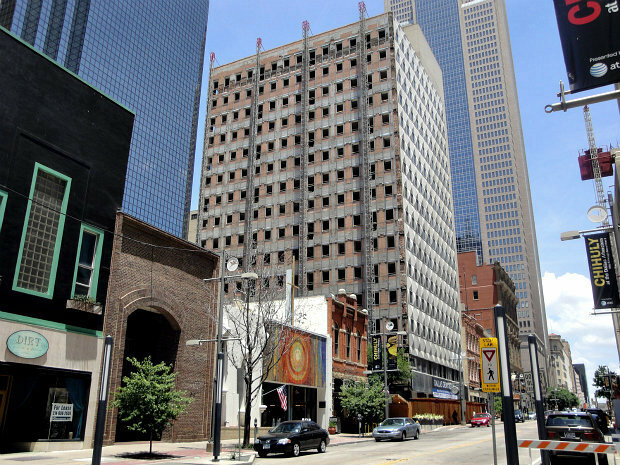 Here’s a 2012 Dallas Morning News photo of it in mid death spiral, being slowly dismantled. See what this view looks like in the most recently updated Google Street View, here. 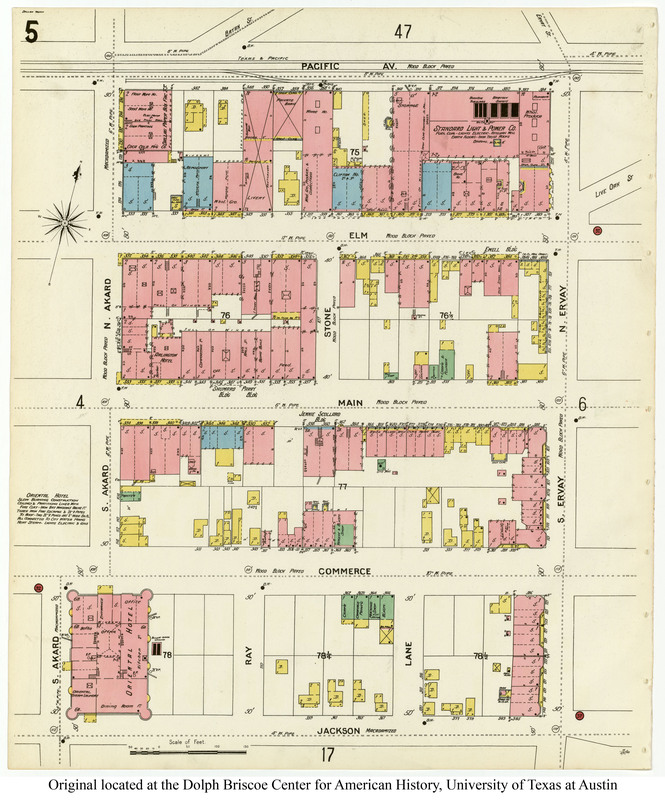 Interested in seeing the development of this block, as chronicled in Sanborn maps? 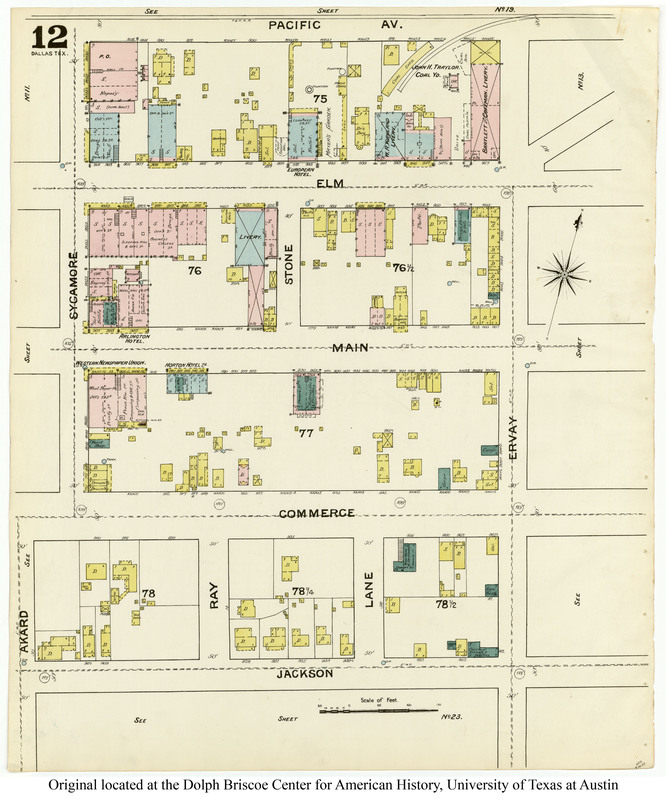 Of particular interest is the northwest corner of Main and Stone — before 1911 the addresses of these two building were 353-355 Main and 357 Main; after 1911 the addresses changed to 1521-23 Main and 1525 Main. 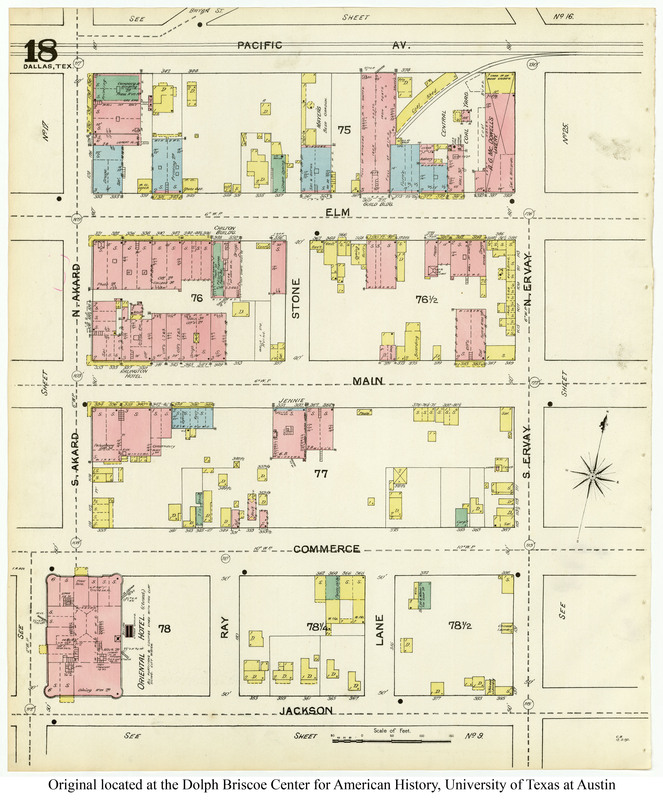 It appears that both buildings were built between 1892 and 1899. 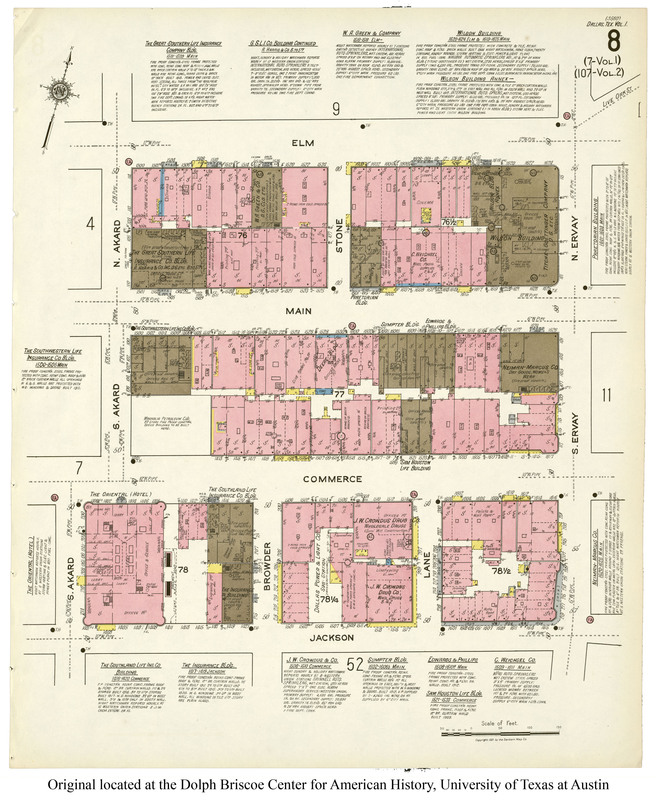 1921 — This map indicates that the 1521-23 building is two stories. 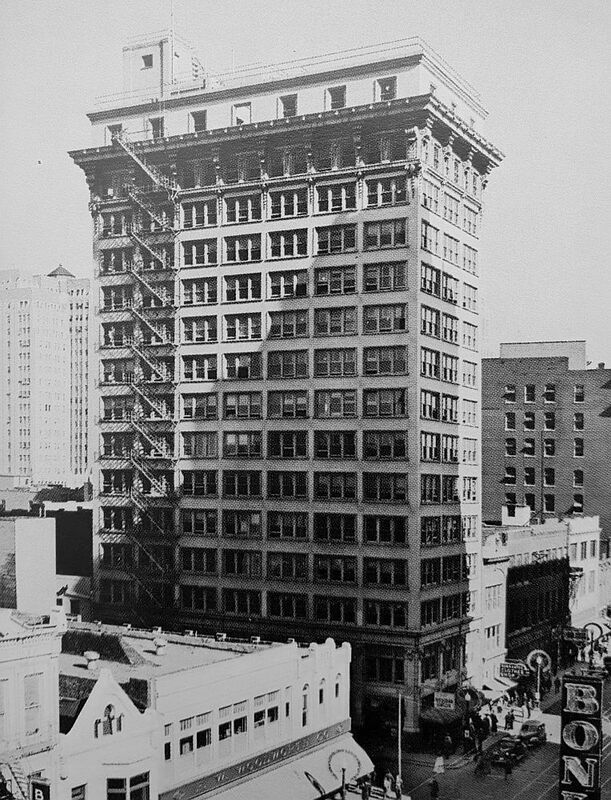 Pictures going back to 1909 (see a couple above) seem to show three stories, but pictures of the building as part of Woolworth’s appear to show two floors (for comparison, the building on the corner at 1525 was two stories). So … what looks like a third floor on 1521-23 Main might be … architectural trompe l’oeil? Either that, or there was demolition and construction and demolition of the two-story building currently occupied by the St. Jude Chapel. This is confusing. Whatever the case, the renovation/restoration of these two buildings in 2001 shows them to look pretty much as they did in the top 1907 photo — once again, that original roofline is present. Below, the 1907 photo is on the left, a 2012 photo is on the right. And here the buildings are today, minus the dearly departed Praetorian (RIP). The photo and detail showing Woolworth’s, circa 1930, is from William L. McDonald’s book Dallas Rediscovered; photo credit cites Cushman & Wakefield, Inc.
Sources of all other images noted, if known. 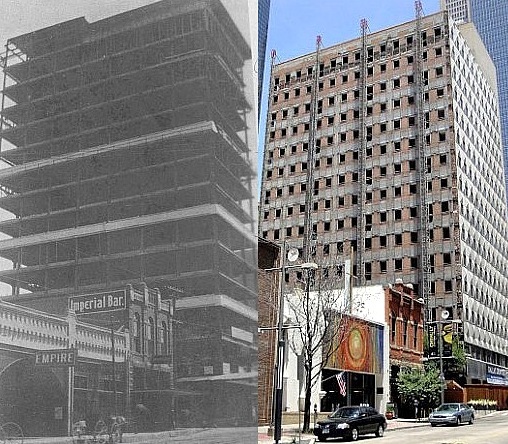 For an entertaining history of the construction of the Praetorian Building (which had MANY detractors and doubters), read check the archives of The Dallas Morning News for the article by Kenneth Foree, “First Skyscraper Had Its Skeptics” (Oct. 27, 1948). More on the Praetorian Building on Wikipedia, here. Most clippings and images are larger when clicked. I worked in the Praetorian Bldg. in 1960. It was YELLOW and they had remodeled the inside, taking away the historic interior. What a shame. Yellow doesn’t really seem to be a color you see utilized in building exteriors. …Probably for a reason. Wow! You really went down the rabbit holes to tell this story. That’s why I absolutely love this blog!